We introduce a method for transforming low-order tensors into higher-order tensors and apply it to tensors defined by graphs and hypergraphs. The transformation proceeds according to a surgery-like procedure that splits vertices, creates and absorbs virtual edges and inserts new vertices and edges. We show that tensor surgery is capable of preserving the low rank structure of an initial tensor decomposition and thus allows to prove nontrivial upper bounds on tensor rank, border rank and asymptotic rank of the final tensors. We illustrate our method with a number of examples. Tensor surgery on the triangle graph, which corresponds to the matrix multiplication tensor, leads to nontrivial rank upper bounds for all odd cycle graphs, which correspond to the tensors of iterated matrix multiplication. In the asymptotic setting we obtain upper bounds in terms of the matrix multiplication exponent ω and the rectangular matrix multiplication parameter α. These bounds are optimal if ω equals two. 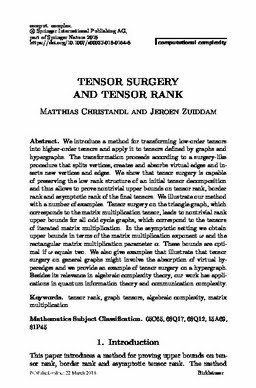 We also give examples that illustrate that tensor surgery on general graphs might involve the absorption of virtual hyperedges and we provide an example of tensor surgery on a hypergraph. Besides its relevance in algebraic complexity theory, our work has applications in quantum information theory and communication complexity.